We are lawyers, and as such we are required to keep much of what we do confidential and many of our clients do not wish it to be known that they needed the services of a maritime lawyer. Still, our clients and colleagues are our best source of referrals, and here are some comments that they have been willing to share. I had the pleasure of working as co-counsel with Mr. Schwenk on a complex civil matter during the summer of 2011. During a lengthy trial, I found Dirk to be extremely well-prepared and unflappable. He has an easy-going manner, which I think both judges and juries appreciate, but don’t let that fool you: Dirk is spot-on with knowing the law and is an excellent advocate for his clients, being suitably aggressive or charming as needed. 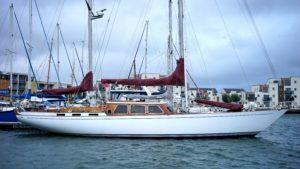 “A few years back I had acquired a 42′ Sailboat through an estate, which I brought down from Long Island to Annapolis in order to sell. Although the boat was never used for personal use, I received a Maryland State boat tax bill for 5% of the estimated value of the boat. I paid the tax, then learned that I might be able to obtain a refund.